The financial markets took today's data in stride. They did so for good reason, there weren't any earth shattering surprises today and traders still seem to be in a quasi-vacation mode. Money managers typically don't get serious until after the Martin Luther King day holiday, which is this coming Monday. The headline CPI showed a .3% increase in prices, which was identical to analyst estimates. Similarly, the Philly Fed index was reported at 9.4 for January, slightly above estimates of 8.0. Tomorrow the markets will focus on housing starts and building permits, but our guess is that a majority of the volume will dry up immediately afterward. As humans we are programmed to assume that a market will travel on a direct path in a particular direction, but that is rarely the case. 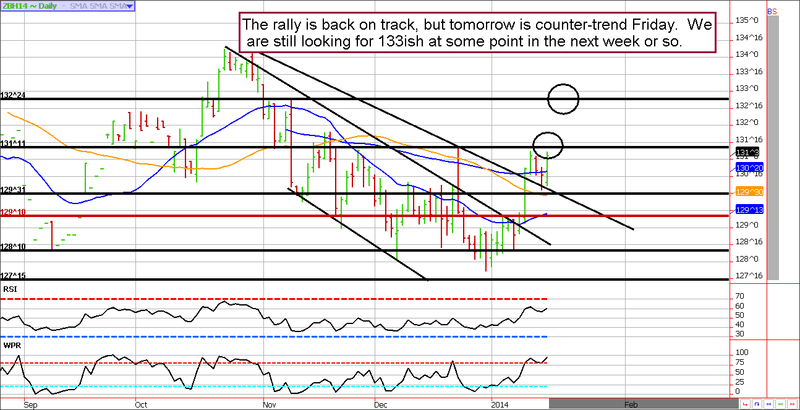 Although the bond market held our noted resistance level, that doesn't mean it won't surpass it. Markets often take technical levels as an opportunity to digest a price change and build up momentum to move to the next level. In our view, that is exactly what we are seeing today. Tomorrow's trade will be tricky due to position squaring ahead of the holiday, so we won't put too much weight into anything we see. We continue to seek the 133ish price range for the March ZB, but it will likely take some time to get there. **Consensus:** We can't chase markets higher; if you aren't long in any way the best move might be to stay on the sidelines. Should we see a large dip, look for bullish opportunities. Ignoring the Monday swoon and Tuesday snap back, the ES has essentially be trading in a 20 point range since late December. As much as the bulls and bears want to argue their case, the reality is that neither side is winning the battle. Although investors don't always put their money where their mouths are, they seem to be doing just that in the current environment. According to the AAII Investor Sentiment Survey, about 39% surveyed believe the stock market will be higher six months from now, while a mere 21% believe it will be lower. Nearly 40% believe the market will be relatively neutral. 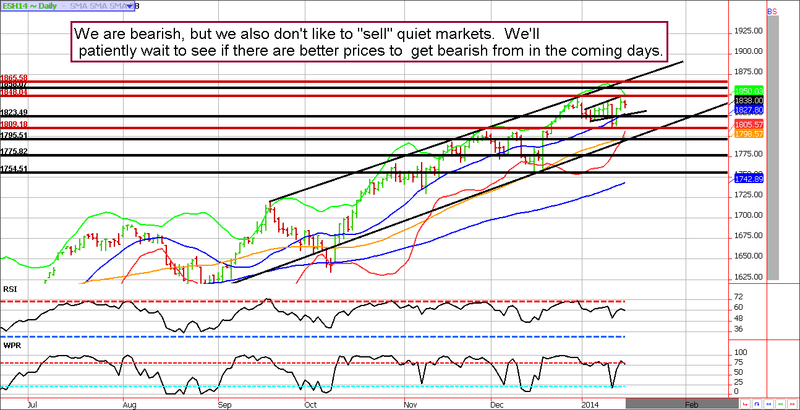 We still believe the buy stops sitting above the market are a target. We'll likely need to run them before there is any chance of a bigger correction. If so, we could see about 1860ish before potentially rolling over. **Consensus:** We hope you survived the chop. We'll be willing to turn bearish again near 1860ish. Stay tuned. December 26 - Sell February ES 1880 calls for about $10.00 in premium ($500). January 14 - Buy back the ES 1880 calls near 4.40 to lock in a gain of somewhere between $280 and $300+ before transaction costs depending on fill prices, etc. December 19 - Add to e-micro gold futures near 1197ish. December 27 - Sell February Euro strangles for about 60 ticks ($750) using the 141.50 calls and the 134 puts. January 3 - Exit additional e-micro gold future at a profit of about $400 per contract before transaction costs. January 6 - Lock in gain on short Euro call (originally sold as a strangle on December 27) of about 24 ticks or $300 before transaction costs. January 7 - Today we sold March coffee 130 calls that were purchased in late October. The net profit was moderate ($200 to $260 before transaction costs for most), but a nice surprise given that our timing wasn't perfect. January 9 - Sell April crude oil 82 puts for about 50 cents ($500). January 13 - Exit e-micro gold futures near 1250. This locked in an overall profit of $500 to $600 for most clients before transaction costs, etc.